At Real Time Cases, we’ve always kept up with Inside Higher Ed, one of our favorite publications. 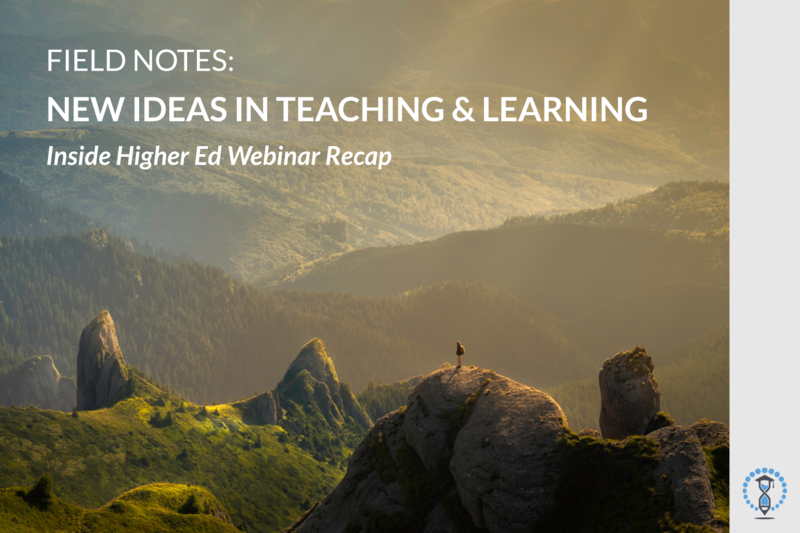 We recently attended their interesting and informative webinar, New Ideas in Teaching and Learning, and wanted to share some of the most compelling nuggets with you. 1.) Faculty members are changing their teaching techniques by using technology in the classroom. Now more than ever, instructors are experimenting with digital technology to enhance the learning experience. In addition to face-to-face teaching, professors are adding online instruction as an additional avenue of learning. At various universities, there are also digitized hubs or knowledge centers where students can access a wide range of materials needed to excel in class; for example, resources for writing, learning, careers, etc. In the physical classroom, professors have enabled the use of iClickers that serve as “confusion” buttons. Students can use these clickers to direct the instructor’s attention to a question they have, or to a point that they don’t understand. Through these more regular check-ins, the pace of lessons can be better-adjusted to the students’ level of understanding. Some universities has even implemented advanced technology such as facial recognition. In these cases, professors are able to use sentiment analysis, such as a positive or negative reaction to the lessons, to see how students are following along. Faculty interactions with students have been rated as one of the most effective factors in positively impacting the students’ learning experience. Actions such as meeting with students one-on-one and having regular conversations with each student in their respective classes has shown to make a significant difference. While this type of personalization is often thought to be found only in elite colleges, other institutions that implemented these strategies saw the same benefits. Surveys have shown that students often have low expectations of faculty-to-student interactions; therefore, when there are personalized experiences such as learning students’ names, it’s a real game-changer that strengthens all aspects of the classroom experience. It’s also interesting to note that when we think of personalization, we often think of it in regards to the learning material, but interactions are another important element. Faculty and student interactions bring forward a deeper connection, on a human level, and not just on a knowledge level. College is expensive, and a common obstacle in teaching is that students are increasingly unwilling to buy textbooks or materials, and those who skip out on these resources tend to not do well in class. According to survey research, 50% of students say their grades were negatively impacted by their decision to delay or avoid purchases. Some students could not buy the books due to financial constraints, while others chose not to buy the texts due to uncertainty of the relevance of the materials. As a response to overcome these challenges, there’s been a growing trend to use digital resources in the curriculum, going back to our first takeaway of digital materials having created new options in learning. Professors have started to use online resources like videos and articles in a “mix and match” effort to make learning as relevant as possible; for example, linking reading assignments of additional news articles to what is going on in the classroom. This is also something that we’ve continuously seen at Real Time Cases, where professors would spend a significant amount of time searching for relevant and low-cost materials that would be interesting to the students. And according to the data we have, we’ve actually seen much more engagement from students with video cases, than with traditional case studies that tend to be more outdated. If you’re interested in learning how our video-based case studies can help you lower costs and the amount of time spent searching for engaging materials, you can book a 10-minute demo here.